BATTLEMEs new record, released the 6th OCTOBER, 2017 WORLDWIDE VIA EL CAMINO MEDIA! Songkick notification when they go on tour! This is a fansite focused on Matt Drenik and BattleMe. Matt Drenik is the former singer and guitarist of the band Lions from Austin, Texas. He started out as the sole artist behind BattleMe. On later albums he took help of other musicians and included a band / team to evolve his sound. BattleMe started when Matt moved from Texas to Portland, Oregon and began to write tracks with his basement as the battleground. Experimenting with the lo-fi, folk and electro genres he created more than 40 tracks before getting signed by Thomas Turners Trashy Moped label in 2010. Nowadays Matt Drenik and BattleMe make their releases through the label El Camino Media. 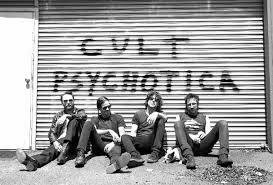 The latest release is Cult Psychotica which was released the 6th October 2017 with some excellent tracks like "No Truth" and "Testament". The album carries a politcal agenda with a lot of criticism to the 2016 election and Trump which shines through in the lyrics. During the seven years that BattleMe have existed they have gotten stellar reviews and quotes by big players in the music industry including Esquire ("if the Flaming Lips had written an original song for their ‘Dark Side of the Moon’ live shows, this is what it might’ve sounded like”), Rolling Stone (who compared BattleMe to Smashing Pumpkins), Billboard and Total Rock. One of BattleMe's most noticed songs are "Shoot the Noise, Man" which was released on the "BattleMe" album in 2012. It has been used as soundtrack in different TV-Shows, Video Games (EAs eSport game-franchise: NHL) and Commercials (PGA Golf Commercial). A lot of different BattleMe tracks have been used by the TV-Series Sons of Anarchy over several seasons. These are the links to the official BattleMe social media accounts and is not affiliated with this fansite.